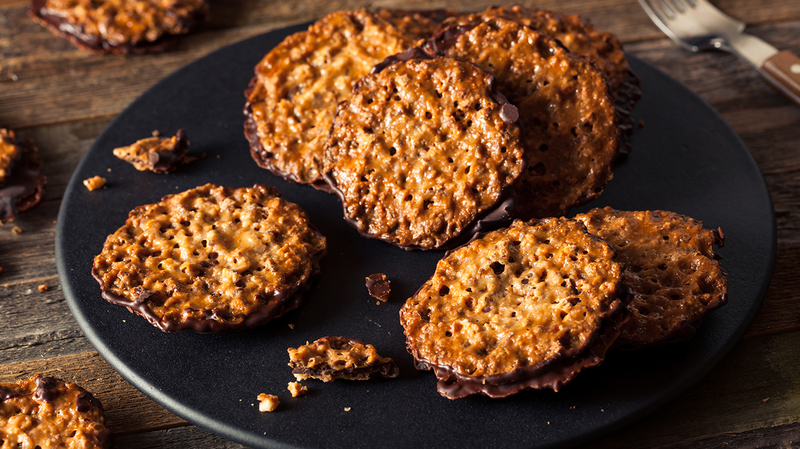 Also known as florentines, lace cookies are perfect for a tea party, the refreshing flavor of lemon and the sweet taste of vanilla make a perfect combination for delightful treat! 1 ½ tsp Amoretti® Lemon Zest Oil Extract O.S. In a medium saucepan, bring sugar, butter, milk, honey and extracts to a quick boil, stirring occasionally. Once boiling, thoroughly mix in flour and almonds. Let mixture cool while preparing the cookie trays. Line cookie trays with parchment paper and dollop teaspoons of batter about 2 inches apart. Bake cookies for 6-8 minutes. Once out of the oven, immediately remove the cookies along with parchment paper from the tray and let them cool on the counter. Spread chocolate on the underside of each cookie. You can press two cookies together to make a sandwich, just coat one side, or drizzle chocolate over the cookies.